Bust out the Canada Gooses and wool beanies, Miami! We’re entering that time of year when arctic blasts send temperatures plummeting into the upper 60s, better known as the same temperature you keep your apartment. Fortunately this brutal chill is offset by the arrival of the holidays, where in Miami we wrap bright lights around palm trees, and the only place you’ll find a white Christmas is a party thrown by "Rick" in the bathroom at LIV. But just because we don’t do holidays like the rest of America doesn’t mean they aren’t just as joyous. Around South Florida we have parades, feasts, the world’s largest Christmas carnival, and an abundance of other events to make this time of year special. 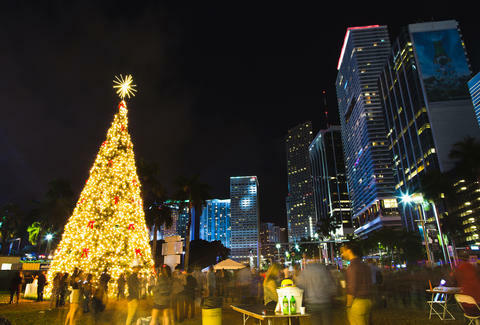 If hearing "Mi Burrito Sabanero" 47 times while walking past millions of Christmas lights, gaudy nativity scenes, Santa on a surfboard and, questionably safe carnival rides run by Rick from LIV doesn’t mean Christmas to you, you’re not really a Miamian. Don’t think too hard about how a chocolate factory managed to put a 2,400-square-foot ice rink in the middle of Palm Beach Gardens. Rather, rent some ice skates, take a few laps, then take a chocolate making class inside as part of the 27th annual winter wonderland. Little Havana’s retro-Cuban nightspot hosts a special edition of pineapple bandshell karaoke on one of the biggest party nights of the year -- which just so happens to be the night before Thanksgiving. DJ Danny Stern will be backing you up all night, starting at 9pm. While drinking with your actual mother-in-law might not be your first choice for Thanksgiving Eve antics, Jezebel has created a drink with that name that’s far more palatable. Try the ginger, apple cider, and maple syrup concoction while Arkitekt plays in the background. They'll also have the full menu available. Two Michelin-starred chef Antonio Mellino has crafted a three-course Thanksgiving brunch that will make the family you’re not visiting even more jealous of your life. Start out with a bronze table antipasti bar with cured meats, cheeses, and grilled Italian vegetables. Then move to homemade pumpkin ravioli, turkey stuffed with Italian sausage, and finish with honey onyx pistachio gelato. At $75 per person, it’s still cheaper than a flight home. If the idea of eating the same Thanksgiving dinner you’ve been having for the past 21+ years isn’t so appetizing, head to Byblos where chef Stuart Cameron is whipping up middle eastern twists like turkey porchetta with saffron brioche stuffing and barberry jelly, and a halvah parfait with white chocolate cream for dessert. The big barbecue out back by the Delano pool will be smoking up your turkey this year if you opt to dine at this Argentine fusion spot. Enjoy smoked ham, turkey legs, Peruvian potato salad and more, all served family style for $75 per person. The Village of Gulfstream Park starts off the Christmas season on a day that actually seems reasonable, beginning its Symphony of Lights with the lighting of a 50-foot Christmas tree, synchronized light shows, an appearance by Santa and Mrs. Claus (complete with selfie station!) and, of course, a live DJ. Fort Lauderdale’s main drag becomes about as close to winter as we can get without jumping on a plane, when the 55th annual Christmas on Las Olas takes over. Sled down a two-story toboggan slope, catch an outdoor showing of Frozen, or just wander the streets listening to carols and enjoying your wassail. Or beer. Whatever. OK, so you probably shouldn’t join in when the ghost of Christmas future points old Ebenezer towards his grim fate, but this production takes the time-honored Dickens tale and gives it some lively musical numbers. It’s the only production like this we’re aware of that doesn’t include Kermit the Frog. Since we don’t have snow in South Florida, we make up for it with excessive amounts of Christmas lights. ZooMiami is no exception, where they’ll open at night with over half a million animal-shaped light sculptures and tree lights, every Friday and Saturday and the week of December 26-30. South Florida’s preeminent vocal ensemble Seraphic Fire sings beautiful arrangements of all the Christmas standards in a candle-lit performance that’ll change the way you think about caroling. They’ll be playing in Coral Gables, Miami Beach, Fort Lauderdale, Boca Raton and Naples. Tickets are going quickly, so grab some ASAP. Nothing announces the holidays in South Florida like the annual Winterfest Boat Parade, where seafarers deck their vessels out in holiday spirit and float through Broward County. If you’re not lucky enough to have a friend with a waterfront house, watch from the grandstands along the shore. Or just join the 8 million other people watching on TV. To many, the festival of lights is just an Adam Sandler song that calls out a slew of Jewish celebrities. Learn what the holiday is actually about with Chabad of Miami Beach, as they celebrate the first night of Hanukkah by lighting Lincoln Road’s iconic menorah, eating latkes, and spinning dreidels. George Balanchine’s The Nutcracker turns 27 this year, and to celebrate its gotten a fabulous new makeover with costumes and sets by Cuban-American artists Isabel and Ruben Toledo. The story of little girl drawn into the eerie realm of the Mouse King and Sugar Plum Fairy stays the same, though. Prepare to have the song from Tetris stuck in your head for a week. The traditional Italian Christmas Eve Feast of the Seven Fishes is prepared for the fourth time by chef Andres Avayu. On the menu this year are seared tuna crudu with Italian tapenade, lump crab stuffed calamari, scallop carpaccio, charred octopus with roasted garlic pomodoro, Italian seafood paella, salmon diavolo, and grilled swordfish with celery root puree. A wise yet crude cartoon one said it’s hard to be a Jew on Christmas. He’d obviously never been to the Matzo Ball, the Christmas Eve shindig where every eligible person who’ll be eating Chinese food the next day lets loose with like-minded people. This year’s 31st rendition goes down at Story, continuing its tradition as one of the best holiday parties in America. Who says those who don’t do Christmas dinner are relegated to sad little paper cartons on their dining room table? If you’re not doing the whole ham-and-goose thing, head to Broken Shaker from 6pm to 2am, where the Chrismukkah Chinese Take Out pop-up will feature duck dumplings, Chinese crispy broccoli, apple pie wontons and more. Miami’s annual roving tribute to our inherent weirdness is back for its 36th rendition, as the King Mango Strut winds its way from Commodore Plaza through Coconut Grove. The parade that brought us the League of Dead Voters and the Million Chad March has had a whole year of political fodder to work from, so this year’s entrants should be among the best ever. A list of holiday activities in Miami would be incomplete without Armando Perez’s preeminent Miami New Years party. This year, Pitbull returns with dozens of food stations helmed by award-winning chefs, drinks from semi-celeb bartender Teddy Collins, and plenty of live performances. Braving the cold for an outdoor New Year's is not something we do. Listening to Demi Lovato and Kygo poolside at the most iconic hotel in Florida? Absolutely our thing. Witness the concert on the pool deck, in a private cabana, or even on the side of the stage if you’ve got an extra 40 grand lying around. If you don't, you can still get access to an open bar from 9pm to 12am and a gourmet buffet dinner for under $400. Your best dining option with views of the fireworks is at the venerable Rusty Pelican, who in addition to throwing a Mad Tea Party from 10pm-2am will also host a grand Wonderland dinner in its ballroom. Here you’ll dine on Alice in Wonderland-themed dishes like “Off With His Head!” – chilled poached lobster with black tea and Thai chili broth. And catch views “through the looking glass” of the fireworks through the floor-to-ceiling windows. Matt Meltzer is a contributing writer to Thrillist who’s learned everyone dancing in The Nutcracker hates The Nutcracker. Follow him on Instagram @meltrez1.